Every so often, a building is demolished or renovated – and a time capsule is found. The items inside it can reveal interesting information about the past. What would you put into a time capsule for future generations to find? Once you figure that out, the next step is learning how to build a time capsule. In Santa Maria, California, a 100 year old time capsule was discovered by construction workers who were digging holes for the foundation of a new sign in front of Santa Maria High School. 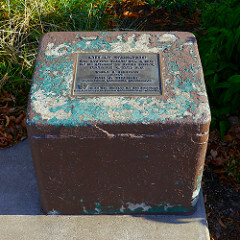 The time capsule was made of a copper box. Inside were three newspapers from 1906, including the Santa Maria Times. Another paper was included that the Santa Maria Historical Society believes is a weekly paper called The Graphic. There was also a yearbook from 1905. Two of the newspapers were unreadable because the copper box had been damaged and moisture leaked into it. The New York Times has some good advice about what to put into a time capsule and what to build the time capsule out of. Overall, you want to avoid things that will decompose over time (such as plants) that could destroy everything else in the time capsule. Don’t put electronic media into your time capsule. There’s a chance that the technology you put into your time capsule will be obsolete by the time it is opened. It would be better to print out photos on archival paper, and store them in protective plastic sleeves, than to store then on a thumb drive. Newspaper will yellow with age. That might be ok if your time capsule is intended to be opened ten years from now. A few clippings from the local newspaper that was printed the on day you put together your time capsule will be informative for those who find it. Choose news that is about your home town. Or, include an opinion piece about the current political situation. The main purpose of a time capsule is enable the people of today to reach out to the people of the future. Put something personal into the time capsule. Write a letter (on archival paper) with a personal message. Share your hopes for what the future may be like. A time capsule can be made of just about any container that is sturdy and that does not allow water to leak into it. The New York Times article noted that a coffee can might last 10 years. Popular Mechanics has a “how-to” for building a time capsule. No matter what materials you use, write the date that you want the time capsule to be opened somewhere on the outside of it. Make a note of the GPS coordinates where you buried (or hid) the time capsule.